Hello! Hello! Hello! My name is Steve Ford and probably you found me through one of my Youtube videos which have reached more than 18,000,000 people worldwide. I have been teaching English for the past 20 years to people all over the world. I was born in Canada where I started my English teaching career. I also lived and taught for many years in Brazil and France. I speak French and Portuguese fluently and I am conversant in Spanish, Italian and I also speak some Russian. Since I came back to Canada in 2002, I’ve taught at some of the most prestigious English schools in the country as well as for the Canadian Government as a TOEFL and ESL teacher. 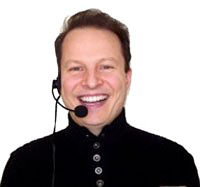 I now live in Vancouver and I teach online full-time using online conferencing software, my own videos and podcasts as well as the best English learning books available via screen sharing. I love teaching English and making Youtube videos has given me the opportunity to share my knowledge with you so that you don’t waste time. All of the music and video editing in my videos is work done by myself and my wife, Leda Ford. I consider my students and my Peppy Club community of 12,000 + members like a large family and many of my online students have been with me for a long time! We learn a lot and laugh a lot together. Please check my testimonials page to see what my students have to say about my classes. I have students that range from company CEOs, doctors, IT specialists, pilots, bankers, dentists, lawyers, sales reps, professors, teachers and students. I also teach the children of many of my students. As you know, I prepare people for difficult tests like the TOEFL, IELTS, SAT and Cambridge. Some students also require my help for university and immigration application. Last but not least, I prepare people for job interviews and I help people with their C.V.’s. Please check out what my Test Prep/Business/Immigration Applicant students are saying about my classes. I hope I have made a difference in your lives. I am based out of lovely Vancouver, Canada. Vancouver has ranked highly in worldwide “livable city” rankings for more than a decade according to business magazine assessments and United Nations’ reports.The city has hosted many international conferences and events, including the most recent 2010 Winter Olympic Games.